I'm new to .NET and I want to learn .NET specially C# and ASP.net. would appreciate if you can forward it to me. You can start downloading video tutors @ http://asp.net/ (http://asp.net/getstarted/default.aspx?tabid=61) or http://www.learnvisualstudio.net/ for series of video tutorial for beginners. You can also search for more video tutorials on google videos, youtube... or microsoft elearning site for webcast. http://search.dailyfreecode.com/ and u will find lot more relevant links. besides on completion of it u wud able to pass MCP paper 70-315. //Example 1 : Adding Minutes to Current Date. //Example 3 : Adding Hours to DateTime Object in .Net. //Example 4 : Adding Time to DateTime Object. //Here we are adding 5 Hours, 5 Minutes and 30 Seconds. //Examples of Retrieving DateTime object value. //Example 1 : Get Day value. //Example 2 : Get Day of Week. //How to find whether day of week is sunday or saturday? int intYear = dt1.DayOfYear; //Similarly you can get Year value. //Similarly you can get Hours, Minutes, Seconds, Milliseconds value. //Make use of Parse Method of DateTime to "Convert String to DateTime in .Net"
//How to Find whether both dates are equal or Not? //How to compare two dates in .Net? Response.Write(dt4.ToString() + " is Less than "
Response.Write(dt4.ToString() + " is Greater than "
//How to Find difference between two dates in .Net? //How to Find days difference between two dates in .Net? //How to subtract one date from another? //Output: Difference between 08-06-2007 00:00:00 and 10-06-2007 00:00:00 is 2 days. //How to Find whether both Time are equal or Not? //How to compare Time in .Net? Response.Write(dt4.ToShortTimeString() + " is Less than "
Response.Write(dt4.ToShortTimeString() + " is Greater than "
//How to Find difference between two Time value in .Net? //How to Find Hours difference between two Time in .Net? //How to subtract one Time from another? //How to find elapsed Time between Two Time value in .Net? //Output: Difference between 22-06-2007 04:30:00 and 22-06-2007 19:30:00 is 15 Hours. //How many days in a given month in .Net? //How to find whether given year is Leap year or not in .Net? //How to find current date and time? //How to find current date? So here are some small but effective quotes collection. Do not deceive people. Sincerity is the best way to impress. There is no road to success but through a clear strong will power. Everyone is wise until they speak. To Improve is to change, to aim for perfection is to change often. You cannot give away kindness, it will always come back to you. Politeness is the art of selecting among one’s real thoughts. Success occurs when opportunity and presentation meet. The full use of today is the best preparation for tomorrow. A reputation is precious, but a character is priceless. Knowledge is power but action gets things done. The future belongs to those who know how to wait. Character is property. It is the noblest of possession. Don’t sit and wait – look for the next opportunity. Commit yourself to a life of self – improvement. Patience and time can be your two best friends. Try making everyday a day of achievements. Condemn the fault, and not the actor of it. Knowledge is a treasure but practice is the key to it. Results count – not long hours of effort. It is a man like to punish but god like to forgive. Focus on making things better – not bitter. Happiness comes from within, it can never come from outside. Indecision can be your worst mistake. Manners are of more importance than laws. Always leave your audience with a memorable message. There is no virtue so truly great and good like a justice. Wise man learns from others mistake. Anger shows the character of person. If you have confidence in yourself, others will too. You may judge a flower by its look but not a human being. People stumble not on mountains but on small stones. My Friend Pankaj has posted a Good Information for those who want to upgrade to Windows Vista. network are ready to run the Windows Vista operating system. Laptop for Game Lover - Look for both High Performance and High End Graphics Enabled. Laptop for Executive - Look for Laptop with comfortable performance speed and latest ads-on. Best Company to buy laptop, below mention list is based on current popularity to purchase laptop. Most of Laptop PC's have Rebate on it or Free Offers, so don't forget to take advantage of it. I hope above mention points will help you to make Best Laptop Deal. Well this was all reviews from Net, but i personally feel as a programmer, Sony T7100 is best for less. The Microsoft .NET Framework 3.0 (formerly WinFX), is the new managed code programming model for Windows. It combines the power of the .NET Framework 2.0 with four new technologies: Windows Presentation Foundation (WPF), Windows Communication Foundation (WCF), Windows Workflow Foundation (WF), and Windows CardSpace (WCS, formerly "InfoCard"). Use the .NET Framework 3.0 today to build applications that have visually compelling user experiences, seamless communication across technology boundaries, the ability to support a wide range of business processes, and an easier way to manage your personal information online. Now the same great WinFX technology you know and love has a new name that identifies it for exactly what it is – the next version of Microsoft’s development framework. This change does not affect the release schedule of the .NET Framework 3.0 or the technologies included as a part of the package. The new technologies delivered in the .NET Framework 3.0, including WCF, WF, WPF, and CardSpace, offer tremendous functionality and innovation, and we wanted to signal that with a major release number. The .NET Framework 3.0 uses the 2.0 version of the CLR. With this release, the overall developer platform version has been decoupled from the core CLR engine version. We expect the lower level components of the .NET Framework such as the engine to change less than higher level APIs, and this decoupling helps retain customers' investments in the technology. There will be no changes to any of the existing .NET Framework 2.0 APIs, assemblies, or namespaces. The applications that you've built on .NET Framework 2.0 will continue to run on the .NET Framework 3.0 just as they have before. The .NET Framework 3.0 is an additive release to the .NET Framework 2.0. The .NET Framework 3.0 adds four new technologies to the .NET Framework 2.0: Windows Presentation Foundation (WPF), Windows Workflow Foundation (WF), Windows Communication Foundation (WCF), and Windows CardSpace. There are no changes to the version of the .NET Framework 2.0 components included in the .NET Framework 3.0. This means that the millions of developers who use .NET today can use the skills they already have to start building .NET Framework 3.0 applications. It also means that applications that run on the .NET Framework 2.0 today will continue to run on the .NET Framework 3.0. The WinFX technologies will now be released under the name .NET Framework 3.0. There are no changes to the WinFX technologies or ship schedule — the same technologies you're familiar with now simply have a new name. *Windows Vista comes with .NET Framework 3.0. There is no separate installation package required. The standalone .NET Framework 3.0 packages are not supported on Vista. Up to 500 MB of available space may be required. CD or DVD Drive Not required. What Improvements does WCF offers over its earlier counterparts? A lot of communication approaches exist in the .NET Framework 2.0 such as ASP.NET Web Services, .NET Remoting, System.Messaging supporting queued messaging through MSMQ, Web Services Enhancements (WSE) - an extension to ASP.NET Web Services that supports WS-Security etc. However, instead of requiring developers to use a different technology with a different application programming interface for each kind of communication, WCF provides a common approach and API. What are WCF features and what communication problems it solves? Unification of Microsoft's communication technologies. Support for cross-vendor interoperability, including reliability, security, and transactions. Rich support for service orientation development. What contemporary computing problems WCS solves? WCS provides an entirely new approach to managing digital identities. It helps people keep track of their digital identities as distinct information cards. If a Web site accepts WCS logins, users attempting to log in to that site will see a WCS selection. By choosing a card, users also choose a digital identity that will be used to access this site. Rather than remembering a plethora of usernames and passwords, users need only recognize the card they wish to use. The identities represented by these cards are created by one or more identity providers. These identities will typically use stronger cryptographic mechanisms to allow users to prove their identity. With this provider, users can create their own identities that don't rely on passwords for authentication. What contemporary computing problems WPF solves? A primary goal of WPF is to address this challenge! By offering a consistent platform for these entire user interface aspects, WPF makes life simpler for developers. By providing a common foundation for desktop clients and browser clients, WPF makes it easier to build applications. WPF relies on the eXtensible Application Markup Language (XAML). An XML-based language, XAML allows specifying a user interface declaratively rather than in code. This makes it much easier for user interface design tools like MS Expression Blend to generate and work with an interface specification based on the visual representation created by a designer. Designers will be able to use such tools to create the look of an interface and then have a XAML definition of that interface generated for them. The developer imports this definition into Visual Studio, then creates the logic the interface requires. XAML browser application (XBAP) can be used to create a remote client that runs inside a Web browser. Built on the same foundation as a stand-alone WPF application, an XBAP allows presenting the same style of user interface within a downloadable browser application. The best part is that the same code can potentially be used for both kinds of applications, which means that developers no longer need different skill sets for desktop and browser clients. The downloaded XBAP from the Internet runs in a secure sandbox (like Java applets), and thus it limits what the downloaded application can do. What is a service contract ( In WCF) ? In every service oriented architecture, services share schemas and contracts, not classes and types. What this means is that you don't share class definitions neither any implementation details about your service to consumers. Everything your consumer has to know is your service interface, and how to talk to it. In order to know this, both parts (service and consumer) have to share something that is called a Contract. In WCF, there are 3 kinds of contracts: Service Contract, Data Contract and Message Contract. In terms of WCF, What is a message? A message is a self-contained unit of data that may consist of several parts, including a body and headers. In terms of WCF, What is a service? A service is a construct that exposes one or more endpoints, with each endpoint exposing one or more service operations. In terms of WCF, What is an endpoint? An endpoint is a construct at which messages are sent or received (or both). It comprises a location (an address) that defines where messages can be sent, a specification of the communication mechanism (a binding) that described how messages should be sent, and a definition for a set of messages that can be sent or received (or both) at that location (a service contract) that describes what message can be sent. An WCF service is exposed to the world as a collection of endpoints. In terms of WCF, What is an application endpoint? An endpoint exposed by the application and that corresponds to a service contract implemented by the application. In terms of WCF, What is an infrastructure endpoint? An endpoint that is exposed by the infrastructure to facilitate functionality that is needed or provided by the service that does not relate to a service contract. For example, a service might have an infrastructure endpoint that provides metadata information. In terms of WCF, What is an address? An address specifies the location where messages are received. It is specified as a Uniform Resource Identifier (URI). The schema part of the URI names the transport mechanism to be used to reach the address, such as "HTTP" and "TCP", and the hierarchical part of the URI contains a unique location whose format is dependent on the transport mechanism. In terms of WCF, What is binding? A binding defines how an endpoint communicates to the world. It is constructed of a set of components called binding elements that "stack" one on top of the other to create the communication infrastructure. At the very least, a binding defines the transport (such as HTTP or TCP) and the encoding being used (such as text or binary). A binding can contain binding elements that specify details like the security mechanisms used to secure messages, or the message pattern used by an endpoint. What is an operation contract? What is a message contract? A message contact describes the format of a message. For example, it declares whether message elements should go in headers versus the body, what level of security should be applied to what elements of the message, and so on. The metadata of a service describes the characteristics of the service that an external entity needs to understand to communicate with the service. Metadata can be consumed by the Service Model Metadata Utility Tool ( Svcutil.exe) to generate a WCF client and accompanying configuration that a client application can use to interact with the service. The metadata exposed by the service includes XML schema documents, which define the data contract of the service, and WSDL documents, which describe the methods of the service. As the use of internet increases, as increases the danger of online identity theft, fraud, and privacy. Users must track a growing number of accounts and passwords. This burden results in "password fatigue," and that results in less secure practices, such as reusing the same account names and passwords at many sites. What are activities in WWF? Activities are the elemental unit of a workflow. They are added to a workflow programmatically in a manner similar to adding XML DOM child nodes to a root node. When all the activities in a given flow path are finished running, the workflow instance is completed. An activity can perform a single action, such as writing a value to a database, or it can be a composite activity and consist of a set of activities. Activities have two types of behavior: runtime and design time. The runtime behavior specifies the actions upon execution. The design time behavior controls the appearance of the activity and its interaction while being displayed within the designer. replace with your homepage .html page. This problem might occur when you install IIS after visual studio, so to resolve this problem try registering “aspnet_isapi.dll” with following command on command prompt. Here v1.1.4322 is .Net Framework version. Cause 1: You are not using InProc Session Mode — The mode attribute of the element in your application Web.config file must be set to "InProc". If it isn't, the End event simply cannot fire. Cause 2: You are not using Session — The Session End event can't fire if there's no Session to End. Check and make sure your application is storing information through the Session object? Cause 3: Your code is imperfect — There might be error somewhere in the code that responds to the End event. For that you can try running your application in debug mode, with a short timeout attribute. Visit the page and then wait. Check whether the Session_End event fires? Check whether for any error occur in your code? Login to SQL Server 2005 with Administration Privileges on Windows Vista OS you need to explicitly login as Administrator to perform administration task on sql server 2005 objects. You will get number of queries on forums for connecting application to database. Most of time they are unable to connect because of incorrect connection string. Lets write code to display data in gridview. string can be avoided and you can be on work without posting query on forum. Finally Exception that you might face while connecting to .net application with sql server 2005 on windows vista operating system. you have used for connectivity is correct. Exception: The server does not support debugging of ASP.NET or ATL server applications. If you have an XP Pro or W2K Pro machine, you may need to think about the order of installation between VS.net 7.0 and IIS. If you install IIS after VS.net 7.0, you will get this error. In this case, please register “aspnet_isapi.dll” with “aspnet_regiis.exe –i”. Exception: Error while trying to run project: Unable to start debugging on the web server. The project is not configured to be debugged. Error while trying to run project: Unable to start debugging on the web server. The project is not configured to be debugged. This was caused because I had renamed the virtual dir that the project resides in - and because of this IIS had decided to revert the dir from an application to a dir. Within the IIS management tool, select your virtual dir. In the Properties dialog box, click on the Create button. Exception: The project is not configured to be debugged. Exception: Could not start ASP.NET or ATL server debugging. Exception: The debugger is not properly installed. Problem 1: Make sure that “Integrated Windows Authentication” is enabled. Probably, you enabled only “Basic authentication” for Directory security of IIS. Problem 2: If you are using “Integrated Windows authentication”, you need to make sure that your user account has full control on the directory of the IIS. Problem 3: If you created the web project with a full machine name (like “machinename.domainname.something”), the web site is recognized as “Internet” site. So the default setting of IE will impact on the behavior of log on. In this case, you need to enable logging on with your current user account in “Internet” area with IE setting. But it is not the default setting of IE, so you’d be better off if you create project with only the machine name. Breakpoint is not working, Can start debugging without error message, but breakpoints are not hit. Problem 1: Please make sure that “asp.net debugging” is enabled in the properties of project. Problem 2: Please make sure that the expected DLL is loaded with matched debug symbol file. You can check it with “Modules” window. Exception: Server side-error occurred on sending debug HTTP request. Problem 2: If you are using the NTFS file format, please make sure that “aspnet” has proper privilege on “wwwroot” or your folder for virtual directory to access and write on the folders. 2) You can use static fields, methods, properties and even constructors which will be called before any instance of the class is created. 3) As static methods may be called without any reference to object, you can not use instance members inside static methods or properties, while you may call a static member from a non-static context. The reason for being able to call static members from non-static context is that static members belong to the class and are present irrespective of the existence of even a single object. 1) A constructor is a special method whose task is to initialize the object of its class. 2) It is special because its name is the same as the class name. 3) They do not have return types, not even void and therefore they cannot return values. 4) They cannot be inherited, though a derived class can call the base class constructor. 5) Constructor is invoked whenever an object of its associated class is created. constructor, C# automatically provides one for you, this is called default constructor. Eg: class A, default constructor is A(). .Net managed code enjoy's benefits of CLR, which automatically checks for object scope and if it is not referenced by any object than it is removed from memory. Each class in C# is automatically (implicitly) inherited from the Object class which contains a method Finalize(). This method is guaranteed to be called when your object is garbage collected (removed from memory). You can override this method and put here code for freeing resources that you reserved when using the object. Console.WriteLine(“Destructing Object….”);//put some code here. 1) A destructor is just opposite to constructor. 2) It has same as the class name, but with prefix ~ (tilde). 1) Garbage collection is the mechanism that reclaims the memory resources of an object when it is no longer referenced by a variable. 2) .Net Runtime performs automatically performs garbage collection, however you can force the garbage collection to run at a certain point in your code by calling System.GC.Collect(). 3) Advantage of Garbage collection : It prevents programming error that could otherwise occur by incorrectly deleting or failing to delete objects. When asp.net processes a web page, its event life cycle follows certain stages. Importance of understanding Page Processing and different event occurs during it, will provide you better understanding of writing a code in proper event. Imagine you have a page with a submit combo-box whose auto-postback property is true. Now whenever value of combo-box is changed a selectedIndex event is fired, but before that a series of other event fires. This event life cycle will be proves to be blessing, when we are creating a dynamic control. For example in above case, lets assumed that whenever combo-box value changed we want to initialize certain control whose value based on combo-box selection. So how will you do it??? Answer is you can create dynamic controls in Page.Load Event and Initialize its value based on combo-box selection in Page.PreRender Event. Initialization of Page is been done, by creating a Instance of page. It is the best place to store initialization code related to page. eg: VS.net uses Init event to attach event handler for other events. Initialization of controls of page is been done. It is best place to create dynamic controls, or initialize the controls. This evnet occurs just before page is about to display. It is the best place to write code which requires to render based on value in controls. eg: Initialization of dependent controls. 4. More than 50 new controls like GridView, DetailsView which offer a seamless ease for displaying data with just a few clicks and configuration. 5. Personalization made easy as never before. 6. Website Administration and User Management made easier than before. 7. WebParts, MasterPages, Themes making Developer's life easier. 8. Extensibility for Mobile Rendering. 9. New features in C# such as Generics, Anonymous Methods. Visual Studio "Orcas" is the next version of Visual Studio and this article provides a preview of the features and why it is compelling to work with. Features of Visual Studio "Orcas"
.NET Framework 3.5 (includes support for 3.0, 2.0 versions) - You can write applications which target any of these versions and Visual Studio would automatically filter intellisense, toolbox controls, and add reference dialog items (among other things) to only show those features supported within that specific version of the framework. You can then compile against each of these different framework releases, as well as get full debugging support for each. ASP.NET AJAX 1.0 (Again, can be downloaded currently from here)All of the above, improved and with much more features and capabilties. Expression Blend is specifically designed for thisSplit View of Design and CodeRich support for CSS .... and much much more. LINQ Support One of the main things, I didnt mention is the support for LINQ. Will talk about it in a later post, but, it would definitely take programming languages to the next level of capabilities, what, with the support for querying Collections, Database and XML - all in the same way we are used to - SQL. For More Features Check Scott Guthrie's post here. Download Visual Studio "Orcas" The "Orcas" CTP can be downloaded from here It comes out it two forms, a pre-configured VPC as well as an individual tool download. It can work side by side with Visual Studio 2005. Session Object - the Session object has been pretty useful to accomplish this task. With Whidbey (ASP.NET 2.0), there is a new feature Profile which allows us to store per-user settings to be used throughout the application. Settings can also be stored in an anonymous profile while users are not logged in, and then migrated to a logged-in user profile at a later time. The major difference between Profile and Session objects are1. Profile object is persistent whereas Session object is non-persistant.2. Profile object uses the provider model to store information whereas Session object uses the In Proc, Out Of Process or SQL Server Mode to store information.3. Profile object is strongly typed whereas Session object is not strongly typed.The similarity between them is that Each user will automatically have a profile of his own similar to Sessions where each user will have his own Session State. Examining the Profile objectA user's profile is a collection of properties that define information you want to store for your web site's users. The user's profile is defined using a simple XML syntax in a configuration file (machine.config and/or web.config). Within your page, you reference a user's profile information with the Profile property. ASP.NET reads the schema defined in configuration, and automatically generates a class that is accessible from the Profile property on a page. You access properties on the Profile just as you would access properties on any other class. The most common use of the Profile feature is storing data for authenticated users, the Profile feature also supports storing information for anonymous users. Storing profile information for anonymous users depends on the Anonymous Identification feature. The Profile and Anonymous Identification features work together to enable the use of the Profile property for anonymous users. The samples included in the QuickStart demonstrate using the Profile feature with both authenticated and unauthenticated users. Prior to the start of the page lifecycle, ASP.NET ensures that the Profile is available for use by the page. Similarly, at the end of the ASP.NET page lifecycle, ASP.NET automatically saves the Profile to the underlying data store(s). As with other features such as Membership and Role Manager, the Profile feature has been designed with a provider-based model. Providers abstract the physical data storage for a feature from the classes and business logic exposed by a feature. The Profile feature ships with a provider for Microsoft™ SQL Server. You can create your own custom providers and configure them to work either the Profile feature. Pages that use the Profile feature will continue to work unchanged with your custom providers. 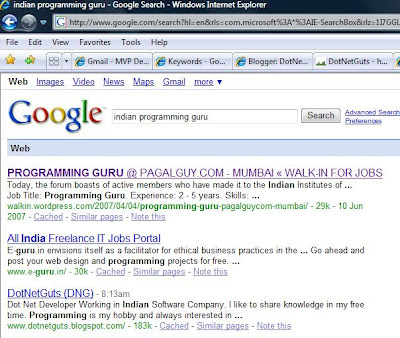 I was searching for a Programming Guru and was surprise with result in Google, I have been sort on front page of google for Indian Programming Guru. Well for me its a moment of responsibility to retain this result forever. 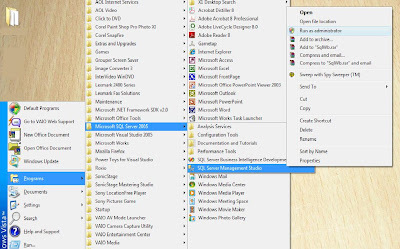 WF is a tool for building workflow enabled applications on windows. The Windows Workflow Foundation namespace in Microsoft .NET Framework is called System.Workflow. Windows Workflow Foundation provides a consistent and familiar development experience with other Microsoft .NET Framework technologies such as ASP.NET, Windows Communication Foundation and Windows Presentation Foundation. Windows Workflow Foundation provides full support for Visual Basic .NET and C#, debugging, a graphical workflow designer and the ability to develop your workflow completely in code. Windows Workflow Foundation also provides an extensible model and designer to build custom activities which encapsulate workflow functionality for end-users or for re-use across multiple projects. Rule-driven workflow in which a set of rules in combination with the state of data drive the order of processing. WCF is a new framework for building distributed applications. It enables developers to build secure, reliable service-oriented applications that integrate across platforms and interoperate with existing investments. WCF solutions can run within the context of a single machine, over company intranets, or across the Internet using a variety of protocols, formats, and message exchange patterns. By combining and extending the capabilities of existing Microsoft distributed systems technologies (Enterprise Services, System.Messaging, .NET Remoting, ASMX, and WSE), WCF reduces the coding and complexity of developing, deploying and managing distributed applications. WCF provides you with a unified programming model that brings together the best aspects of existing Microsoft technologies. What this means is that, with WCF, you will no longer need to wonder “which technology do I use (ASMX, Remoting, etc)” when building a connected system. All of the application-to-application and intra-application communication for your connected will be handled by WCF. This unified programming model is exposed to you through the System.ServiceModel namespace.